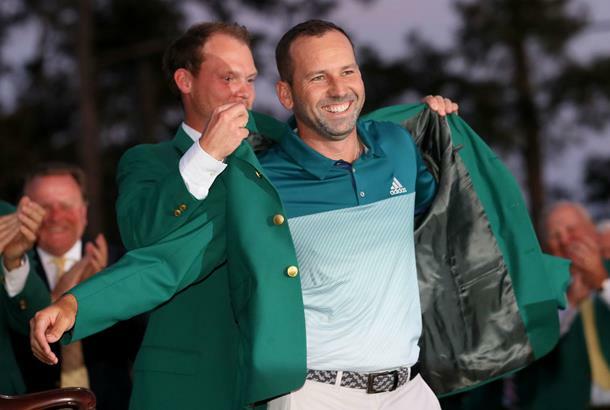 Sergio Garcia outlasted Justin Rose on the 1st play-off hole to win his first major title in one of the most dramatic back-nine Sunday battles in the history of the Masters. Its not often you would have thought two European’s would make up the final Sunday pairing at Augusta National, and it turned in to one of the most enthralling fourth-round duels that is certain never to be forgotten. Both Garcia and Rose found themselves at the top of the leaderboard with an advantage at different points in the day, needing a good run to get back in to contention in what at times had the feel of a crucial Ryder-Cup singles match. Garcia was the first to put himself two clear as birdies on the first and third holes gave him the dream start to gain the initial advantage – but the Olympic and former U.S Open Champion was not for backing down. Rose birdied the 6th, 7th and 8th holes to ensure the two Ryder Cup stalwarts and good friends made the turn tied at eight-under-par. The Spaniard quickly faltered to drop shots at both 10 and 11, and memories of missed major chances gone by seemed likely to get a new addition when he pulled his drive in to the pine trees on 13 and was forced to take a penalty. But this was a different Garcia - one who would finally rid himself of his ‘best player without a major’ title and achieve that long overdue elusive major at the 74th time of asking. A par on the 13th was followed by one of the most incredible 8-irons to the 15th green where he chased in an eagle to put the hypothetical match to all-square. The last person to have an eagle on the 15th hole on Sunday on their way to a Masters victory? Fellow Spaniard Jose Maria Olazabal, in 1994. Two astonishing shots found the dance-floor on the par-three 16th, but Garcia was the one to miss his slightly shorter attempt to gift the advantage to the Englishman with two to play... and then instantly gained it back at the next. Garcia was left with a short but incredibly tough-to-read chance on the 18th the first time around for victory, but it slipped by on the right edge to force the play-off. "It's been such a long time coming." Garcia said after his win while beaming with clear delight. "I knew that I was playing well. Today I felt the calmest I have ever felt on a major Sunday and even after making a couple bogeys I was still very positive I still believed there were still a lot of holes I could get to. I'm so happy"
"I knew that I was playing well enough to make something happen, and that putt (on 13) really kind of turned the clock a little bit for me, it kind of got me even more confident"
Garcia and Rose, who are good friends and have played together countless times, spurred each other on, and Garcia attributed their battle to the fact they both wanted to force the other player to win it. "We're really good friends and we're very respectful of one another," he said. "We were cheering each other on, we both wanted to beat the other guy not that guy to lose it"
Justin Rose was gracious in defeat, and echoed the thoughts of many many golf fans out there who were just please Sergio finally got over the line. "There is a consellation there. It's hard not to feel good for him," he said. "If there's anyone to lose to, it's Sergio. He deserves it." "There was a moment I felt like I had it wrapped up but this course offers an opportunity for a come back and he did and it was great fun to be a part of." "From my point of view I did virtually everything right. I've had my fair share of things happen to me and I'm sure there'll be many more in the future. I felt pretty calm, I really enjoyed it, felt complete control - it just wasn't enough"
Former Masters Champion Charl Schwartzel finished closest to the leaders at six-under-par, while the experienced Matt Kuchar and Masters rookie Thomas Pieters were one adrift of Schwartzel. Paul Casey mounted one of the most convincing front-nine attacks on the leaderboard by making the turn in 32, but he wasn't able to get under par for the back-nine and ended up in solo 6th. Rory McIlroy finally posted an under-par round of 69 to make it inside the top 10 at three-under, but it was too little too late for the man that is still searching for his Masters victory to complete the set of major titles. McIlroy ended up tied for 7th with Kevin Chappell, and were propped up Adam Scott and Ryan Moore at two-under-par. The surprise non-contenders came from the hotly anticapted penultimate pairing of Rickie Fowler and Jordan Spieth, who failed to build on their momentum from previous days. Fowler at one point held the co-lead, but both players dropped back to one-under for the tournament in disappointing rounds which included Spieth revisiting the water at the horror 12th hole of last year.